With the pressure on, the Iowa Barnstormers were able to produce their first win of the last six weeks as they nearly defeated the number one offense in the league last week, the Utah Blaze, by a slim margin of two points. The ‘Stormers matched the Blaze score for score the entire first half of the game and both teams headed into the locker room with 34 points on the board. Utah took control of the third quarter and extended their lead to five points, but the Barnstormers wouldn’t back down. Iowa’s strong defense prevented the top offense from scoring at all in the fourth quarter. A late interception by Patrick Stoudamire sealed the deal for the Barnstormers to walk away with a win. Although the Barnstormers fought hard for the victory, they remain in last place in the National Conference, Central Division. 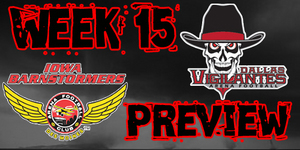 With a victory finally under their belts, the Iowa Barnstormers (3-7) are looking to carry their confidence into this week’s game against the Orlando Predators (7-3). Both teams have the playoffs in sight, and are fighting to be contenders. Orlando will bring a top five rushing offense to the arena to match up against Iowa’s sixth place passing offense. This will surely be a defensive battle and the team who gets the most defensive stops will be the team who comes out victorious. The Orlando Predators were on the road last week against the Milwaukee Mustangs. In what seemed to be a very strong defensive battle, Orlando had the lead at halftime, 7-6, over the Mustangs. The game picked up pace a little more in the second half as both teams went neck and neck for the remaining two quarters. Orlando was able to pull out the victory, 35-30. The win kept the Predators in second place in the American Conference, South Division while the Mustangs fell to last place in the American Conference, East Division. Iowa Barnstormers vs Orlando Predators will be broadcast LIVE on 1700 AM The Champ, on the Internet at www.theiowabarnstormers.com and at www.nifty-tv.com. -This will be the eighth meeting between the Iowa Barnstormers and the Orlando Predators in their franchises’ history. Iowa leads the series 4-3. Brad Banks’ cool, calm and collective demeanor last week helped lead the Barnstormers to victory over the number one offense in the league. Banks matched Utah’s Quarterback, Tommy Grady, score for score for most of the game, but outperformed Grady on completion percentage with 68%. He threw for 223 yards, including seven touchdown passes, and rushed for a total of 42 yards. Banks is ranked 4th in the league for rushing yards per game, 5th in total offense, 7th in passing average per game, and 10th in pass efficiency.